No, just come on in and receive one-on-one service. We fit on a first come, first serve basis. Saturdays can be very busy and to insure a "first come" fitting, a sign in sheet is used. Please be patient, once you are in the fitting room you will have our undivided attention. We are open Monday-Saturday 9:30 a.m. ‑ 6:00 p.m. and closed on all holidays. The Brown parking structure is located directly behind our building and offers two hour free parking. There are also meters out front. We open at 9:30 AM, before usual retail business's do, which often allows you to park right in front at that early hour. There is no specific amount, but the average fitting takes between 15-20 minutes. Do I need to bring my dress? No, but it helps. In case you are unable to bring the dress, we recommend that you bring a picture. 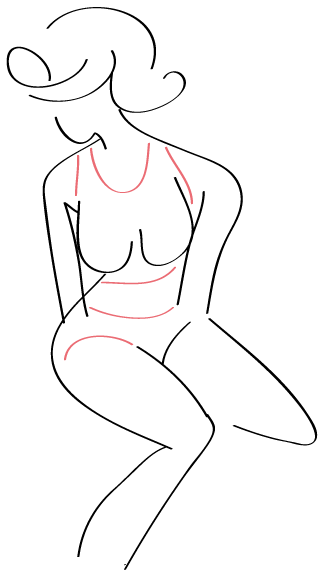 If the dress requires a low back or front, mark your body with a pen so that we can use the mark for a guide. Do you make your own bras? No, we have many styles and brands to choose from that will accommodate your needs. We have been doing this for a very long time and know about specific brands and styles that will work for you that traditional department stores do not have or know about. We carry such a wide variety of sizes and have the largest inventory in the state, so we can usually find you the perfect fit without an alteration. However, on rare occasions, bras sometimes need altering. This is never a problem as we use a seamstress who is very skilled at working on them. Please allow at least a week for alterations, as she is not located on site. The alteration costs vary depending on what work is required. I have one breast larger than the other can you help with this? Yes, we offer silicone forms, liners and pads that easily fit inside of a bra pocket, and they look so natural that no one would know. Can you order bras on-line? No, we do not sell bras on-line for various reasons. First, you should be fitted at least once a year to make sure your body has not changed. Even if you have not gained weight, the body shifts. What fit last year is not guaranteed to fit this year. 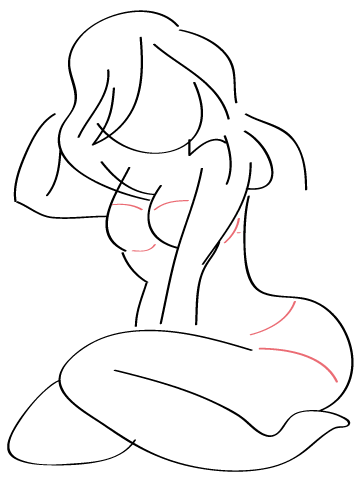 Secondly, manufacturer's often change materials, which can alter the original fit of the bra. Generally, a bra should last about nine months to a year, assuming you are taking the best measures to preserve it. Merchandise can be returned for a full refund within 7 days of purchase. After 7 days, an exchange or due bill will be issued. After 90 days, all sales are final. The merchandise may not be worn, and the tags must still be attached for the policy to apply. Q: How do I get the most life out of my bra? A: We recommend hand-washing your bras in Lovlast Cold Water Cleaner for fine fabrics, after every two or three wears. Use approximately a teaspoon of Lovlast for each bra, and hand-wash in a bathroom basin. Q: Why can’t I wash my bras in the washing machine on a gentle cycle? A: You can wash your bras in a washing machine, however it’s the rinse cycle that is so detrimental to garments. The rinse cycle twists and turns the bras, bending and stretching the wires. If you can’t take the time to hand-wash your garments, please be sure to use a lingerie bag. Q: Can I use any detergent? A: Yes, you can use any laundry detergent, but some are much better than others, and some do not break down the elasticity of the fabric. We recommend Lovlast because it’s been on the market for more than 30 years and is proven to help keep all of your fine washables in pristine shape. 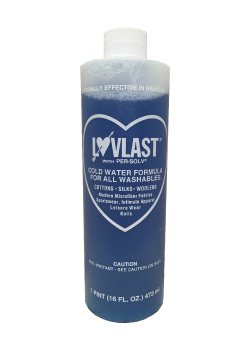 Lovlast is an awesome cold water cleaner. There are no phosphates, bleaches or decolorants, which also makes it safe for the environment. And because you only use it in cold water, it is energy saving as well. You don’t have to use additional laundry additives either. It’s effective in hard or soft water, and Lovlast cleans microfiber fabrics, synthetics, woolens and delicate cottons. Lovlast removes perspiration, without affecting color or causing a dye run, as well as stains from lipstick, ballpoint pens, blood, grease and oil, makeup, and chocolate. This cleaner also will protect the stretch of Lycra, Spandex​, elastic​ and natural rubber. If you consistently use Lovlast on any stretch clothing, you will maintain the hugging stretch of the fabric much longer. If a fabric is safe in cold water, it will be fine with Lovlast. We sell it in three sizes: one pint, one quart, and a half-gallon container.